20 février 1815: La frégate américaine USS Constitution(Charles Stewart) capture la frégate anglaise HMS Cyane, 34 (Gordon Falcon) et le HMS Levant, 18 (George Douglas) au large de Madère. Commences with light breezes from the E and cloudy weather. At 1 discovered a sail two points on the larboard bow--hauled up and made sail in chace--At 1/2 past 1 made the Sail to be a Ship's at 3/4 past 1 discovered another Sail ahead--made them out at 2p.m. to be both Ships, standing closehauled, with their their Starboard tacks on board. At 4 p.m. the weathermost ship made signals and bore up for her consort, then about ten miles to the leeward. --We bore up after her, and set lower topmast, top gallant, and royal studding sails in chace--At 1/2 past 4 carried away our main royal mast--took in the Sails and got another prepared. At 45 minutes past 5, they made all sail close hauled by the wind, in hopes of getting to windward of us.--At 55 minutes past 5, finding themselves disappointed in their object, and we were closing with them fast, they shortened sail and formed on a line of wind, about half a cableslength from each other. At 6 p.m. having them under the command of our battery, hoisted our colours, which was answered by both ships hoisting English Ensigns. 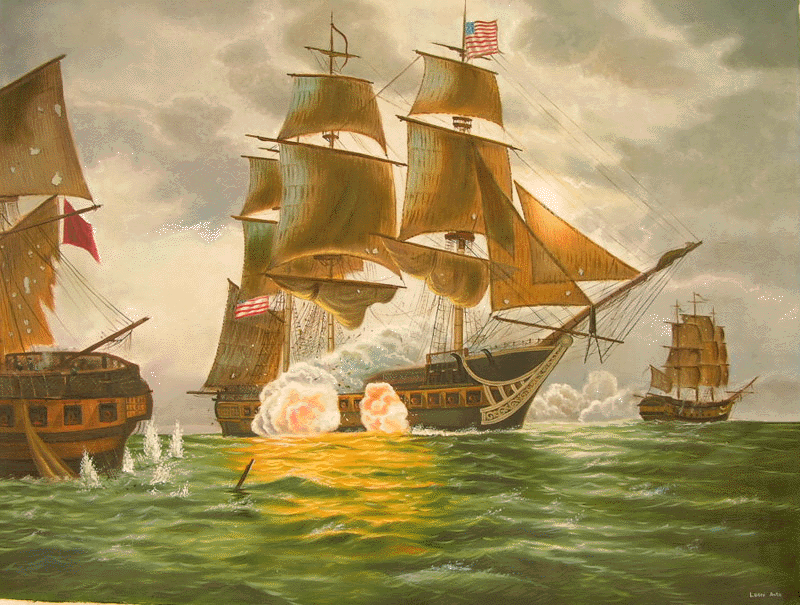 At 5 minutes past 6, ranged up on the Starboard side of the Sternmost Ship, about 200 yards distant, and commenced action by broadsides, both ships returning fire with great spirit for about 12 minutes, then the fire of the enemy beginning to slacken, and the great column of smoke collected under our lee, induced us to cease our fire to ascertain their positions and conditions. --in about 3 minutes, the smoke clearing away, we found ourselves abreast of their headmost ship, the sternmost ship luffing up for our larboard quarter--we poured a broadside into the headmost ship, and then braced aback our Main and Mizen Topsails, and backed astern under the cover of smoke, abreast the stern most ship, when action was continued with spirit and considerable effect until 35 minutes past 6, when the enemy's fire again slackened, and we discovered the headmost bearing up-filled our topsails-shot ahead, and gave her two stern rakes--we then discovered the sternmost ship nearing also-- wore ship immediately after her, and gave her a stern rake, she luffing too on our Starboard bows, and giving us her larboard broadside. We ranged up on the larboard quarter, within hail, and was about to give her our starboard broadside when she struck her colours, fired a lee gun, and yielded. At 20 minutes past 6, took possession of H.M. Ship Cyane, Captain Gordon Falcon, mounting 34 guns At 8 p.m. filled away after her consort, which was still in sight to leeward -- at 1/2 past 8 found her standing towards us, with her Starboard tacks closehauled, with top-gallant set, and colours flying-- at 20 minutes past 8, ranged close along to windward of her, on opposite tacks, and exchanged broadsides--wore immediately under her stern and raked her with a broadside, she then crowded all sail and endeavoured to escape by running--hauled on board our Tacks, Let Spanker and Flying jib in chace--and 1/2 past 9 commenced firing on her from our starboard bow chaser. --gave her several shot which cut her spars and rigging considerably--at 10 p.m. finding they could not escape, fired a gun, struck her colours and yielded. We immediately took possession of H.M. Ship Levant, Honorable Captain George Douglas, mounting 21 guns. At 1 a.m. the damages of our rigging was repaired, sails and the ship in fighting condition. Source: Enclosure in Captain Stephen Decatur to Secretary of the Navy Benjamin Crowninshield, dated May 1814, National Archives, Record Group 45, Captain's Letters Sent, 1815, Vol. 3, No. 93. Throughout the night standing to the northward and westward under short sail on the starboard tack continuing on this tack without seeing any thing untill 1h 10m. p.m. on Monday when a sail was cried from the mast head as being on the weather bow: hauled up for her under all sail, shortly after another sail was descried on the lee bow and word from aloft that the ship to windward had bore up for us. As we were now in the direct track for craft bound from the Mediterranean to Madeira &c felt assured that none but men of war would manoeuvre in this way and were not mistaken. At 2:30 p.m. the ship standing for us displayed signals which not being answered she squared away to the westward to join her consort setting all studding sails and making a great display of bunting, which she enforced with a number of guns. Set every rag in chase, the wind rather lulling. At a few minutes before three commenced firing from the forward guns on gun deck, the shot falling short ceased firing; at 3:15 opened again from the forward guns the shot just reaching. At 3:45 carried away the main royal mast which enabled the chase to distance our fire. Set Carpenters to work to make a new royal mast which they completed about 5. At 5:30 the breeze freshening a little. The ship to leeward tacking to the Southward under all sail. At 6 the weather ship passed under the stern of the other and spoke with her took in light sails and both of them hauled up their mainsails and hauled too on the starboard tack in line. At 6:10 ranged ahead of the sternmost which we found to be a frigate built ship, bringing her on the quarter and her consort on the bow distant about two hundred yards, and opened our broadsides which was returned with great quickness and spirit and some degree of precision; continued exchanging broadsides until the whole were enveloped in smoke upon the clearing away of which perceived we had got abreast of the headmost ship, manned both sides in case it should be necessary to wareship, and backed the main and mizen topsails and dropped into our first station, the ship on the bow backing her topsails also; broke the men off from the starboard battery and renewed the action from the larboard; after a few broadsides the ship on the bow perceived the error she had committed in getting stern board, & filled away with the intention of tacking athwart our bow, the ship on the quarter at the same moment falling off perfectly unmanageable; filled away in pursuit of the former and compelled him to put his helm up at about one hundred yards distant pouring several raking broadsides into him. He made all sail before the wind which we did not think proper to reduce knowing his crippled situation would enable us to overhaul him after securing his consort, wore sound and ranged alongside the latter when she hoisted a light and fired a gun to leeward and upon being hailed to that effect replied she had surrendered. Sent a boat on board and took possession of His Majesty's Ship Cyane Capt Gordon Falcon mounting 34 guns 32 pound carronades -- having received her Commander and officers on board with the greater part of her crew ordered her to keep company and filled away in chase of the other gentleman and in short time discovered him on the weather bow standing for us. In a few minutes he luffed to and fired his broadsides which was duly repaid, he then tacked ship and made all sail by the wind receiving a rake from our starboard broadside; set the Royals and soon gained his wake and opened upon him from the gun deck chase guns with great effect and in a few minutes after she hoisted a light and hove too. Ranged alongside, sent a boat on board and took possession of His Majesty's Ship Levant Capt. Douglass, of 18 32 pound carronades and 2 long 12 pounders. The whole of this business occupied about three hours, only forty-five minutes of which were taken up in compelling both ships to yield to our superior gunnery. The Cyane when she struck had five feet water in the hold and otherwise very much cut up, her masts tottering and nothing but the smoothness of the sea preventing them from going over the side. The Levant in a condition somewhat better, her spars having generally escaped, but her hull pretty well drilled and her deck a perfect slaughter house, in fact so hardly had she been dealt with on deck that her men by the acknowledgement of their Officers twice went below from their quarters. The Constitution lost not a spar but the fore top gallant yard, and was in better order if possible to have fought a similar action than when the late one commenced. The loss on the part of the two ships was upwards of forty killed and nearly double that number wounded, the Constitution had four killed and eleven wounded. Two or three hours sufficed to place the three ships in a condition to make sail and by four o'clock on the morning of Sunday Feby. 21st they were standing to the Westward. Source: Indiana University, Lily Library, A.Y. Humphreys journal, Humphreys Manuscripts.